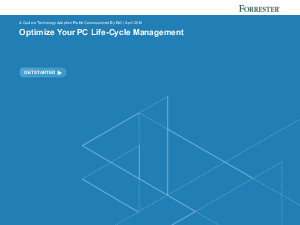 Managing the PC life-cycle environment can be a complicated and expensive process. Enterprises with old and outdated systems require increased support, have higher maintenance costs, and see interrupted workforce productivity. However, consolidating processes and enlisting the help of vendor partners will greatly reduce costs and provide expert-level knowledge for a better PC life-cycle management operation. In April 2016, Dell commissioned Forrester Consulting to conduct a study with 230 IT decision-makers with knowledge of desktop infrastructure environments at their organization. All respondents were significantly involved in the decision-making process for PC and device management and had significant expert-level knowledge about the PC life-cycle process.